After 18 months of development, Konsileo has officially launched! We received over 100 applications to join the disruption. We will be shaking up the insurance industry, as a commercial insurance broker with some amazing tech behind us, broking as we know it will become modernised and get back to the roots of being client-centric. With our brand-new tech brokers will save up to 60% of time spent on admin and compliance, giving them even more time to focus on building relationships with clients. 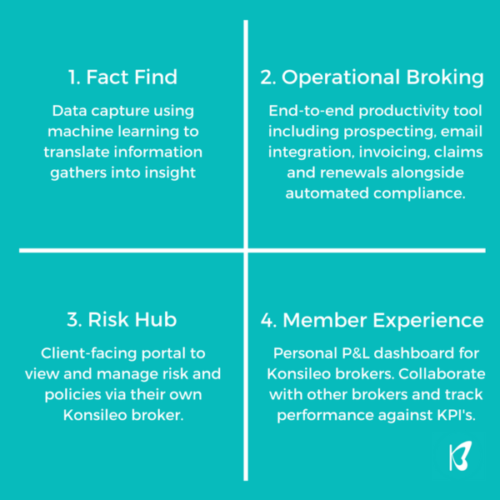 By using data and digital tools, we can drive operational efficiencies as well as eliminating the traditional hierarchical structure that many existing broking firms adopt. So what is it that makes Konsileo tech the key for our brokers? All the components required for a brokers day-to-day role will be on one central platform so that they can manage their workload more efficiently, working autonomously but with a collaborative community on hand should they need any mentoring from fellow brokers or to work together on specialist products for clients with more complex insurance needs. Fact Find is now live, with Operational Broking going live in May and the final components being produced in Q3 of 2017. If you would like to learn more about Konsileo and how you can get involved as a founding broker – get in touch, we are hiring brokers to start using our platform now!